As the third installment of the scholarship program, in its inaugural year, LabRoots announces a fall scholarship of $2,000 to be awarded to a college student seeking a STEM degree. LabRoots, the leading provider of educational and interactive virtual events for tech innovators, engineers, and scientists from around the world, is once again excited to announce the latest scholarship opportunity in their recently-launched college scholarship program. 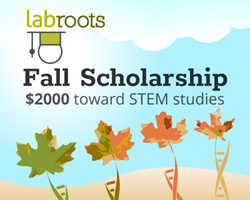 After seeing great success with their Spring STEM Scholarship and Summer Textbook scholarship, LabRoots is again offering a scholarship award to a worthy student seeking a career in science, technology, engineering, or mathematics (STEM) fields. This will again be a merit-based scholarship and is open to all students 17-years or older, including high school seniors, undergraduates, and graduate students. The Fall STEM Scholarship will award one student $2,000 to aid in the cost associated with their academic pursuits, including tuition, books, research projects, training, etc. Applications period will open September 1, 2017, and close November 30, 2017. Once applications are in, the LabRoots scholarship committee will review all applicants, notifying the winner no later than December 15 via email. To apply, students need only submit their resume, CV or transcript, an a 250-word essay. LabRoots has always emphasized collaboration through digital innovation, becoming a primary source for current scientific news, webinars, virtual conferences and more. This scholarship program aims to encourage and develop students’ interest in STEM, prolong research goals, and elevate STEM in schools. Eager to extend that to the next generation of innovators, LabRoots supports young students pursuing degrees in the STEM disciplines. Parents, teachers, counselors or students interesting in applying for this scholarship, please visit the LabRoots site here.